Laura Bradford has read 5 of 30 books. Laura Bradford read 20 books of their goal of 20! Months later, she Aka Elizabeth Lynn Casey. To ask Laura Bradford questions, please sign up. Laura Bradford Oooh, good one! I'm going to go with the complete change of someone I once knew. Why? How? As of the writing of this post, we're just 2 weeks away from the June 7th release of Éclair and Present Danger (book # 1 in my new Emergency Dessert Squad Mysteries). I just got back from the post office where I mailed off packages to the winners in my recent Goodreads Giveaway. Fun book. Charming main character. Enjoyed her growth. 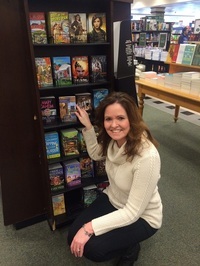 Laura Bradford has read 5 books toward their goal of 30 books. I really enjoyed this book and will continue to read my way through Lisa's backlist. Very good writer. Very good storyteller.
" We'll see.... :) "
Loved every single page of this book. Very inspiring and real. Lisa Unger is a fantastic writer! It was hard to walk away from this book when my workout was over, but it made going back to the gym the next day a whole lot easier! Laura Bradford has completed their goal of reading 20 books for the 2018 Reading Challenge! What is your favorite cozy mystery series?